Stories make Amador’s items “must haves.” Amador runs through his mental Rolodex of valuables, matching items to customers. Having worked in the home health care business for over a decade, his carryover is being a people-reader. 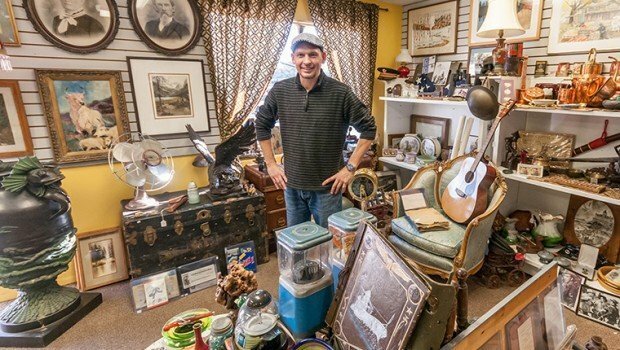 Programs like “American Pickers” and “Junkyard Wars” spurred even more enthusiasm for antique hunting, opening up new dialogue. The store consigns, as well as buying directly from individuals. Those entering for the first time comment on carefully arranged displays, deep-toned walls, and museum-like precision, or that they think they’ve just walked into a Seattle or Bay Area shop, exactly the direction A.E. Hudson’s wanted to take the vibe. He points to a print from 1886, a fine bronze with a $3,500 price tag, and specialty rocks for a dollar. There are primitive, Asian carvings, Native American items, and old maritime toys. Amador’s current favorite is a vintage, hand-carved, hand-painted panel screen from Southeast Asia, once owned by Senator Frank Church. Amador is happy with the fact that most everything his North End store obtains is from the Boise area, so purchasing A.E. Hudson’s items is the epitome of buying local. They’re also expanding the business in leaps and bounds on Ebay. Amador appreciates that he’s continually surrounded by memories, even when it comes to the name of his business. The “A” stands for Avalon, the “E” for Ella, and the Hudson stands for, well, Hudson, all three his offspring. “We tried to make it sound ‘old,’” Amador adds, and then discloses the rest of the story: his partner is the very person who took him collecting as a child, none other than his antique-savvy mom.